Eighty percent of the food we eat relies on pollination. One of the most glorious treats we consume comes straight from the pollinators themselves: Honey. While the problem of colony collapse disorder has received widespread attention, not many people know about the toxic result of this problem in our food supply. In recent years, studies have reported the rapid collapse of honey bee colonies. What’s killing the bees is as widely debated as the methods used in attempts to fix the problem. Bee keepers’ methods range from organic to pharmaceutical, and it’s the latter that’s cause for food safety alarm. In China, beekeepers are known to use a quick cure to fight bee disease through the use of ciprofloxacin, also known as Cipro. This potent antibiotic was used to treat anthrax in 2001 — it’s scary stuff. The FDA does not allow the use of this antibiotic in American food because there’s a real threat that it will cause bacterial resistance. Chinese honey has also been found to contain another harsh antibiotic, chloramphenicol, which has been linked to DNA damage and carcinogenicity. There are additional reports that have found Chinese honey to contain heavy metals, like lead, from storage containers. Furthermore, Chinese honey, when packaged for sale, rarely contains much of that thick syrup produced by bees. Instead, any number of products including corn syrup, rice, or barely products are combined to create “funny honey” — far cheaper to produce than honey. It looks and slightly tastes like the golden syrup — but there’s not much honey to it. But that’s honey in China, right? What’s that have to do with you and me? Sadly, according to a Food Safety News report, America’s top honey packers are using tainted Chinese honey, despite a ban, by “laundering” the honey. Chinese honey is shipped to other countries like Thailand or India, relabeled, and imported to America. The FDA is largely ignoring the problem. So, that bottle of honey you just purchased from your big chain supermarket? There’s no way of knowing where that honey came from — and packagers are not required to list its country of origin. You won’t find a “made in China” stamp. From a consumer standpoint, there’s almost no way to know whether your honey is safe. Almost. The one surefire way to ensure that you’re getting 100% pure, contaminant-free honey is to shop locally. According to a Grist.org report, “four or five of the 12 major U.S. honey packers are responsible for most of the illegal purchases.” Find a local beekeeper and buy directly from them. In Illinois, beekeepers joined forces to improve legislation making it easier for small-scale producers to sell their honey to the public. 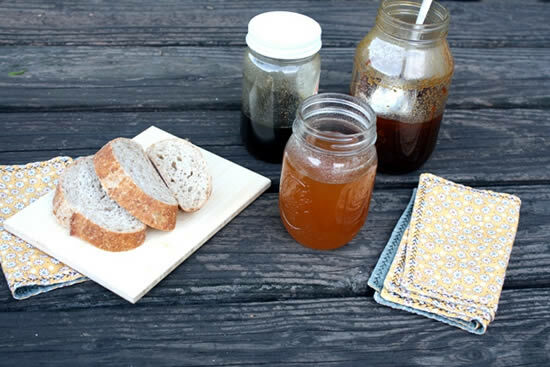 At many local farmers markets across the country, you’re likely to find local honey for sale. Of course, this only solves part of the problem. In the U.S., 65% of our honey consumption comes from sweetened, processed foods like cereals and breads. If you want to be certain your honey mustard, your bread, or your breakfast don’t contain “funny honey,” you’re better off making them from scratch. I make Double Jack Quesadillas with Honey & Seasonal Fruit Salsa at Awake at the Whisk. Hank Shaw makes his own honey mustard at Hunter, Angler, Gardener, Cook. White on Rice Couple makes homemade wheat bread with honey. Last year’s October Unprocessed featured my Date Cocoa-Nut Candy and Kimberly Morales’ Honey-Nut Amaranth Alegrias. Amber Stott is the founder of the nonprofit Food Literacy Center, whose mission is to inspire kids to eat their vegetables. They teach low-income elementary school children cooking and nutrition to improve our health, environment, and economy. Amber was named a Food Revolution Hero by the Jamie Oliver Food Foundation, and of course grows her own groceries at home in Sacramento, California. Learn more about the work the Food Literacy Center is doing on Instagram, Twitter, and Facebook. Great information. I’m fortunate to acquire my honey from a friend’s local organic farm. She also shares her organic eggs with me, and occasionally lets me babysit the chickens and the farm. Her wonderful honey makes all the difference in my cooking and jams. Wow! That sounds like a great friend to have. The honey is the above photo was also gifted to me by a wonderful beekeeper. It’s inspiring to hear their stories! Wow! I had no idea. None! Now I’m wondering about the giant jug of honey in my cupboard. Well, as you pointed out, the best way to go is shop local. Great post, Amber. Thanks, Rowdy Chowgirl! 🙂 Happy to shed light on this problem. I’m guessing you have some amazing options with the multitude of markets in your neck of the woods. In fact, I need to check out the Seattle honey next time I’m in town. Seaside honey bees must make some lovely nectar! Thanks for the info. Had already decided to pursue honey as an unprocessed sweetener that could be purchased locally. This recipe worked out pretty well for me.